I have found a good use for these (and other similar rings for the other classes). When raiding Kael these come in nice and handy. Many of the giants fall in less than 20 seconds (depending on how many melee you have) so a quick click on these and you get instant faction. Even if the spell is resisted (for the amount of damage it does, it hardly matters) you still get the faction hit and the raid leader isn't screaming at you for overnuking. So save your Ice Comets, Lures, and Manaburns for mobs that are worthy of your mana. Equip this in an upper level inventory slot, make a hotkey you can click on and in no time your CoV and Thurgadin factions are all set. This works just as well if you are trying for other factions as well... Kael raid is just an example. I know it is not exactly a mana regen.. but more a mana recovery... but don't forget about Harvest. Laquered jems are made thru jewelry skill and require the combine of the needed jem and a jar of laquer in the jewelry kit. BUT... be wary that laquering a gem destroys its inherant resale value unless it is used to create pottery. any info on this laquered gem? is it crafted ? mob drop? So what's the recipe for this ? and when does it become trivial ? Wizardess of the Fighting Chefs of Norrath, Lifetime friend of the Silver Dragon Society. reply at the wrong place... ignore please. Wizzys have no regen whats that pet for mister. Anyway back to reality if this doesnt have to be worn then it could be good for pulling with when you run out of arrows. Depends on the range. HAHAHAH, I don't know many wizards that "pull with arrows". Very creative item, well done VI. (you don't hear that too often). 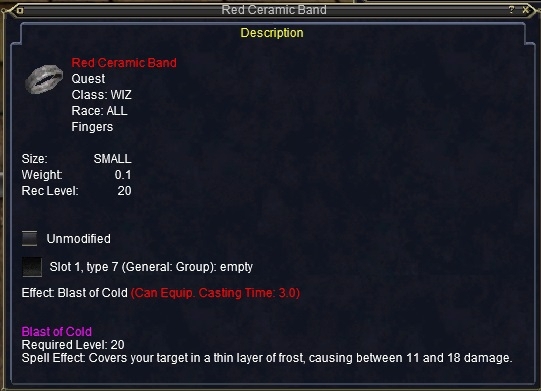 Give these crafted rings no cast time, with a few seconds re-cast and they would be useful. Are you aware that they CAN'T give items recast times? ...I'm pretty sure there's a recast time on Donal's BP. there is gael. AKA manaburn. leave an icon on the mob as an unoverwriteable debuff. First of all Wizards do have mana regen! The wizard Pet gives mana regen and at lvl 52 you get a dmg asorb shield with mana regen on it! And 2nd there is a bunch of items with a kind of recast delay on them! Have fun! It is just a game! There is no item with a *re*cast delay. They all have casting delays (instaclicky = 0 cast delay) but no recast delay. The thing with the Donal's BP is not a recast delay since you can immediately use the BP on someone else after you get done with your first target. Umm... ever try to use one of the new mod rods twice in a row? [Fri May 23 01:44:25 2003] You experience a mystical transvergance. You have taken 450 points of damage. [Fri May 23 01:44:31 2003] Spell recast time not yet met. There are items with recast delays. If you dont believe me, ask your friendsly neighborhood mage for a rod of mystical transvergance and try to click it twice in a row. End of subject. I believe (although I could be wrong) that the EFFECT of "Mystical Tarnsvergence" has a timer delay on it. which would mean that THIS items could not have a delay as the effect is not unique to items and there is no recast delay on the spell itself. like I said I could be wrong but that's always been my understanding of the mod rod delay. this could easily be tested by using a mod rod -> destroy it -> have another summoned for you -> and try again. Done and done. Used clicky on mod rod, was last charge so mage summoned another. Could not immediately reclick it. Had to wait the normal 10 minutes or however long to click it again.